Luxury motor charter yacht 'Janie' offers luxurious accommodation for 10 charter guests in 5 cabins, all with their own en-suites, as follows: Her Master Suite includes a private office, a Walk-around King Bed, a luxurious en-suite bathroom (with dual entries from the bedroom and office area). There is also a Large Spa Pool tub and oversized shower, two washbasins, two toilets and bidet and Settee, vanity, expansive closet and dresser space, a Flat Screen Plasma TV/DVD/VCR/CD/AM-FM Stereo. Janie’s Guest Stateroom is Below Amidships, Aft Starboard Walk-around King Bed, en-suite head with shower and tub and Flat screen Plasma TV/DVD/VCR/CD/AM-FM Stereo. A second Guest Stateroom is Below Amidships Aft Port with Walk-around King Bed, en-suite head with shower a Flat screen Plasma TV/DVD/VCR/CD/AM-FM Stereo. The yacht’s third Guest Stateroom is Below Amidships Forward Port with Walk-around King Bed, en-suite head with shower a Flat screen Plasma TV/DVD/VCR/CD/AM-FM Stereo. Her fifth Guest Stateroom is Below Amidships Forward Starboard with Two twin berths, plus Pullman, en-suite head with shower a Flat screen Plasma TV/DVD/VCR/CD/ and AM-FM Stereo. PRICES & AVAILABILITY: Prices are per night and 'from' in the currency shown. 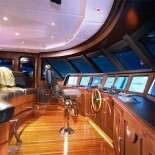 Motor yacht Janie has a price which is based on a per day rate for a week long charter. Luxury motor charter yacht 'Janie' is a truly magnificent new super yacht from Trinity Yachts. Janie offers a very complete list of all the luxuries one can imagine including an impressive array of large TV/sport monitors which are all capable of split-screen displays, data overlays, and the like. Janie’s interior is stylish and traditional and features great use of natural timbers. 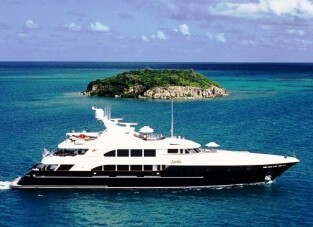 She is available for charter in the Mediterranean in summer and the Caribbean in winter. Her charter rates are $157,000/week, plus expenses in the Caribbean (Winter 2004/2005), holiday rate is $165,000/week, plus expenses with a 10-day minimum, and in the Mediterranean (Summer 2005): Low $165,000, High & Events $175,000/week plus expenses. Janie's luxury charter amenities and extras include the following: a 34’ Custom Intrepid a 18’ Twin Hull Nautica RIB (with Beach Ramp for easy access), Wave runners, Ocean Kayaks with seats, A Complete Saltwater Fishing Outfit, 8 complete sets of SCUBA EQUIPMENT plus Dive Compressor, Water-skis, a Wakeboard and assorted towable water toys, Wetsuits, and Neoprene Safety Vests. She also offers a Sky-deck Spa Pool with a Daylight Flat screen TV and a BBQ Grill as well as beach picnic equipment. M/Y JANIE is a true entertainment palace at sea which boasts one of the most advanced electrical entertainment systems available and includes a DVD and CD Server (which allows access to hundreds of movie and music titles at your fingertips), with instant access. 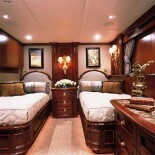 The entertainment system throughout the Janie includes all staterooms. Communications includes a SeaTel VSat Communication with continuous Broadband Internet access and voice over IP telephone, a Fleet 33 Voice, Fax, Data, Two Ericson GSM Cellular Telephone Terminals and a Wireless Network Access throughout vessel for Laptops. Resort Disclaimer: The resorts and their particulars displayed in the results above are displayed in good faith and whilst believed to be correct are not guaranteed. All information is subject to change without notice and is without warrantee. A professional ResortWorld vacation consultant will confirm details during your resort selection process. Starting prices are shown in a range of currencies for a one-week charter, unless otherwise marked. Exact pricing and other details will be confirmed for your destination and dates by your luxury resort consultant.